The City of Boise is proposing switching its parcel of land south of the Blue Valley mobile home park with one poised to be turned into a trucking terminal by a developer. R&L Carriers wants to build a logistics center on the outskirts of east Boise on the other side of the freeway from the Micron campus. 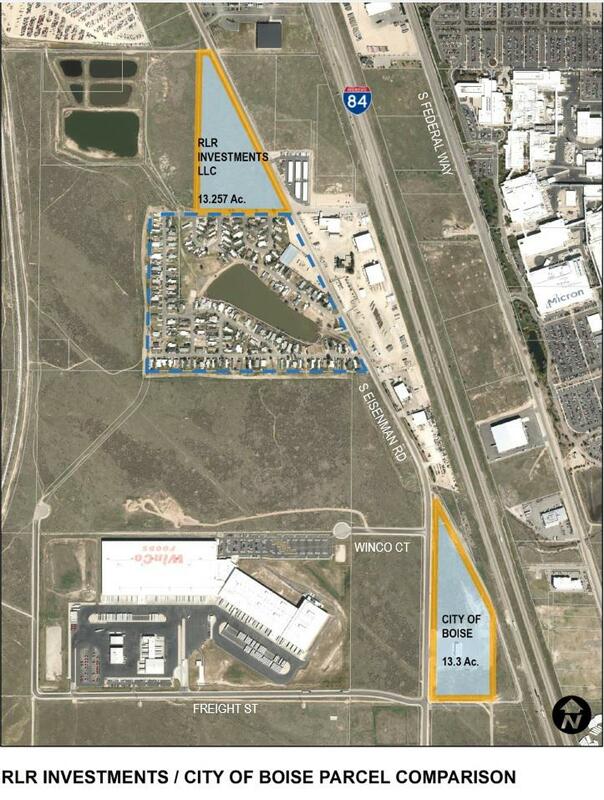 The 13-acre parcel the company plans to develop abuts the Blue Valley mobile home park. The project has residents voicing concerns about noise, exhaust fumes and traffic. The plot R&L has its sights on is zoned for industrial construction. In March, the Boise City Council approved the company’s proposal to build the trucking facility adjacent to the residential area. However, after months of negotiations, a possible land swap deal with the city is on the table. The switch would move R&L’s truck terminal a quarter-mile away from Blue Valley to a nearly identical 13-acre parcel owned by the city. A closed gas station is currently on the city property. Should the switch get approval, Boise would clear the site ahead of R&L beginning construction. In a release from the city, Mayor Dave Bieter says despite the developer’s right to build where it wants, the company being open to the transfer shows a willingness to be a good neighbor. The Boise City Council will vote on the land trade Tuesday. Bieter says the city will work with residents of the Blue Valley neighborhood to determine what’s a good fit for the adjoining 13-acre site. Dozens of people attended this week’s Boise City Council hearing about a proposed trucking terminal. It would be right next to the 200-unit Blue Valley mobile home park. Neighbors like Betty Davidson expressed concerns about air quality and noise. "I feel this will be a safety issue that will not be good for the kids of our community," Davidson says. "In addition with all these diesel fumes and other pollutants, it won’t be very safe to spend time outdoors."